FILE - House Foreign Affairs Committee Chairman Ed Royce, R-Calif., presides over a meeting on Capitol Hill in Washington, Oct. 12, 2017. Proposed cuts in the 2019 foreign assistance budget could jeopardize U.S. security and democracy-building efforts abroad, U.S. lawmakers warned the director for the U.S. Agency for International Development at a hearing Wednesday. "These proposed cuts would impact a number of U.S. priorities, including efforts to combat terrorists, combat poachers and human traffickers," House Foreign Affairs Committee Chairman Ed Royce, a Republican from California, told fellow members in a hearing with USAID Director Mark Green. "U.S. leadership was key to stopping Ebola in West Africa, and continued engagement is needed to address future health threats before those health threats could hit our shores," Royce continued. He underscored that the cuts also could diminish U.S. support of democratic institutions worldwide. Consideration of the 2019 foreign assistance budget comes as the State Department is set to change leadership, with CIA Director Mike Pompeo awaiting Senate confirmation to replace former Secretary of State Rex Tillerson, whom President Donald Trump fired this month. USAID is an independent agency that works closely with the State Department abroad on U.S. government policy objectives. 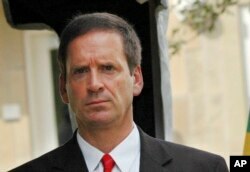 FILE - Mark Green, director of the U.S. Agency for International Development, is pictured at the U.S. Embassy in Tanzania, Aug. 7, 2008, when he was U.S. ambassador to that country. Lawmakers from both sides of the aisle expressed concern about the White House's proposed 33 percent cut that would bring USAID's yearly budget to $16.8 billion, a change they noted would make only a small fraction of a difference in federal spending. "USAID accounts for roughly one-half of 1 percent of the total federal budget. So arguments that we cannot afford it just don't fly with me," said Representative Eliot Engel of New York, the ranking Democrat on the Foreign Affairs Committee. "I just want to ensure that any changes are done to modernize American development and make it work better and not simply start with a budget number and downsizing to fit it." A former House member whom the panel warmly welcomed back to the chamber, Green defended the White House budget, saying, "The president is attempting to balance what he sees is needed for the security of our citizens, advancing American leadership and our commitment to efficiency and effectiveness." Green told the committee that USAID's new mission statement includes "an explicit commitment to strengthening democratic governance abroad," pledging to continue the agency's long-standing work supporting electoral processes and democratic expression. Executive branch budgets provide Congress with a suggestion of funding priorities. After making their way through the legislative process, agency budgets are often in significantly different form. Lawmakers also singled out bright spots in the White House budget they said would address needed organizational changes at USAID. "The budget prioritizes funding for programs and promotes greater self-reliance, including helping countries mobilize their own resources for development. It emphasizes transparency, as well as accountability and programming for results," Royce said. The Trump White House has asked for greater accountability from international partners, suggesting the U.S. has shouldered too much of the burden for common defense and aid during past administrations. Some House Democrats argued the cost of international aid is a worthy investment, however, assuring U.S. national security and reaping longer-term benefits. 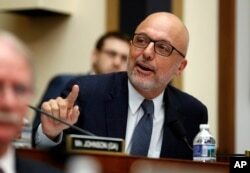 FILE - Rep. Ted Deutch, D-Fla., is pictured during a House committee hearing on Capitol Hill in Washington, Dec. 7, 2017. "I understand that our dollars are not unlimited and that we need to prioritize, but this budget does not seem to prioritize some of the most important assistance and development projects that the U.S. has invested in for years," Representative Ted Deutch, a Democrat from Florida, said. "Not because it helps people in countries around the world, but because it's in our own national security interests." Green told the House panel he is working to use the resources he has available as much as possible. "We are working very hard to encourage our partners around the world to do more, and I think many of them are," Green told the panel. "We're seeing increased contributions from Germany, France, particularly South Korea and Japan, also mobilizing domestic resource mobilization programs to help those countries where we're working better capture their own revenues and resources." In his testimony, Green addressed a number of pressing development challenges worldwide, including anti-corruption efforts in Ukraine and the Syrian refugee crisis. Additionally, USAID is facing challenges from a potential rival in China, which announced this month it would be setting up its own international development agency to better coordinate foreign aid for President Xi Jinping's Belt and Road Initiative, promoting a new Silk Road in China and beyond. Green addressed lawmaker concerns about China, saying the U.S. would take a different approach. "There is the China choice, which is sweetener money up front, and then the fine print and the indebtedness," he said. "What we're trying to do with our assistance is to help countries build the ability to lead themselves. So what we want is self-reliance."